Last week at the biotech conference SynBioBeta, I swiped one of Okanagan Specialty Fruits’ Arctic Apples and put it in my purse. The Arctic Apple is the first genetically engineered apple, modified so that when it is cut, it doesn’t turn an unappetizing shade of brown. When I got home, I sliced it up and stuck it in the fridge. A day later, it was still the same firm, crisp white. Five days later it was only starting to take on hints of brown. I checked the apple this morning, a week and a half after slicing it up, and it still looks fresher than most apples just an hour or two after being cut. I put some in my yogurt. Not bad. The Arctic Apple is a great example of the kinds of things that might happen when you fuse modern genomic technologies with agriculture. Neal Carter, president of Okanagan Specialty Fruits and a descendent of many generations of apple farmers, said that the Arctic Apple was conceived as a way of increasing apple consumption and decreasing apple waste. The Arctic Apple, Carter told Gizmodo, will hit the shelves of as many as 400 supermarkets across the country at the beginning of November. Carter expects that this year’s harvest of about 180 thousand pounds of apples will last about 12 weeks. The apples will be sold sliced, just like baby carrots. The first variety of Arctic Apple to hit shelves will be Golden Delicious; next year the company plans to roll out Granny Smiths. What’s most remarkable about the Arctic Apple, though, is not that they don’t brown—outlets like Starbucks have already figured out how to do that using antioxidants, and home cooks have long known that a little bit of lemon juice can keep sliced apples crispy-pale for hours. 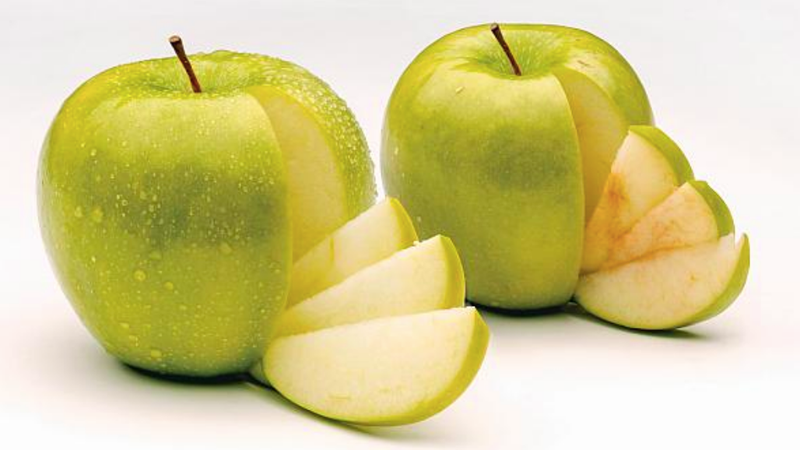 What’s remarkable is that the Arctic Apple is being marketed as a genetically engineered apple, to consumers. The labels on packages of Arctic Apples won’t disclose directly that it’s a GMO, but it will bare the apple’s snowflake logo, along with a QR code that links to more information about the apple in accordance with GMO labeling laws passed last year. The Arctic Apple has a consumer-facing website that explains in a chirpy, first-person tone exactly how the company makes its non-browning apples by silencing the gene the controls polyphenol oxidase production using a technique called RNA interference. Farmers have long been an easy sell for GMOs—what farmer doesn’t want enhanced crops? But Carter is betting that with transparency, consumers may one day get the benefits, too. This will be no easy task. The only thing consumers and scientists disagree more about than GMO food is climate change. Environmental groups like Friends of the Earth have steadily campaigned every step of the way against the Arctic Apple. But the Arctic Apple may also be helped by the fact that it is not “transgenic”—meaning it contains a gene from another species—as many of the first genetically engineered commodity crops like corn were. For consumers, plants that simply have their own genes deleted or altered may not have the same ick factor as, say, a tomato with flounder genes. Not to mention that in the US, engineered plants that don’t introduce new genes don’t face the same regulatory hurdles. Similarly engineered produce like the bruise-resistant Innate potato are already on the shelves. But no company has championed its genetically engineered genes so publicly as Okanagan. Is Breast Milk Good for Grownups?